On February 13, 2016, I was honored to be one of the featured guests at Meet The Artists XXVIII Gala Reception, sponsored by the Indianapolis Public Library! Here is an interview from that event. I’ll be co-hosting the show with friend and fellow author, R.J. Sullivan. Together, we will explore and discuss Pop Culture, geeky stuff, etc… While R.J. and I are often in sync with our opinions, we contrast sufficiently to make for insightful, positive and interesting conversations. The show will be sponsored by the Speculative Fiction Guild, shot in Indianapolis, Indiana primarily at our Two Towers Talk Show Studio, but also sometimes on location at various conferences, conventions and community events. We will also place a strong emphasis on Indie and Small Press authors from around the globe, as well as Indy region authors. Over the holidays, I approached R.J. with the idea of creating a YouTube talk show about things we normally would spend quite a bit of time talking about anyway. Coincidentally, he had already had pretty much the same idea (Great minds think alike!). We’re both looking to have individual video and editorial features where we discuss personal Pop Culture interests as well. R.J. and I have had plenty conversations about the various directions the show may go, but we both agreed that things like this are best grown organically, and that’s how this show will develop. Sometimes we will be broadcasting live and/or on location, where we will be taking a selection of twitter questions as well. The show will begin airing on YouTube starting in March 2016 and has a companion blog/website and social media presence (see below). Please be sure to check back with us here for regular updates and also at the above outlets, as we embark on this new and adventurous journey. We look forward to interacting with you all! THE GOD PARTICLE CONSPIRACY (CODENAME: KNIGHT RANGER, BOOK II) RELEASED TODAY! Today, the God Particle Conspiracy (Codename: Knight Ranger, Book II) was released in eBook and print formats! Readers who have enjoyed tales from John F. Allen’s Ivoryverse, debuting in his novel The God Killers and later, the Codename: Knight Ranger Book I novella, are sure to enjoy his latest spy-fi, action adventure! Synopsis: An Interpol agent investigating international money laundering goes dark. A video surfaces which shows the agent’s death by the prototype of a stolen super weapon at the hands of a Neo-Human black market arms dealer. The international, supernatural counter-intelligence agency known as G.E.N.E.S.I.S., sends Captain Alexandre “Neal” Du Bois, a.k.a. Knight Ranger, and the creator of the weapon, Dr. Hakim Okafor, to Berlin to investigate. Neal and Okafor encounter a deep cover G.E.N.E.S.I.S. agent with dubious objectives and an heiress with a scheme to disrupt the political landscape of unified Germany. Worse, the heiress has thrown in with a megalomaniac who plots to use secret Nazi technology from World War II to corner the global energy market. Can Neal and Okafor thwart this powerhouse alliance? And how will they cope when an even greater evil surfaces? Tomorrow Comes Media invites you to return to the world John F. Allen introduced in The God Killers, in a week-long celebration of his latest urban fantasy release, the Urban Fantasy/Spy-Fi novella Codename: Knight Ranger! The tour runs from November 2, 2015 through November 8, 2015, and you can sign up by clicking HERE! Synopsis: Captain Alexandre Cornelius “Neal” Du Bois is a US Army Ranger and decorated war hero. When his unit is ambushed by supernatural hostile forces while in Afghanistan, only Neal survives. When he wakes up in a secret government facility, Neal discovers that his whole life has changed forever. A shadowy government agent named Elijah Bishop arranges for Neal’s brain to be transplanted, without his permission, into a bio-engineered body capable of amazing feats. Armed with advanced body armor and weaponry, he becomes the epitome of the Ultra Soldier. To protect his family and those closest to him, he must let the world and everyone he loves believe he is dead. With assistance from Dr. Avery Clarkson–the scientist responsible for his new body–Neal reluctantly utilizes his superhuman abilities to work for Bishop and his organization called G.E.N.E.S.I.S. (Global Espionage Network of Elite Supernatural Intelligence and Surveillance), in order to track down those responsible for the slaughter of his unit and keep the world safe from supernatural terrorist forces. 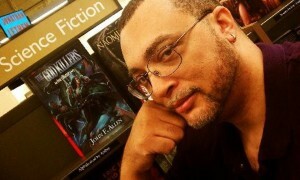 About the Author: John F. Allen is an American writer born in Indianapolis, IN. He is a member of the Speculative Fiction Guild and the Indiana Writers Center. He began writing stories as early as the second grade and pursued all forms of writing at some point, throughout his career. John studied Liberal Arts at IUPUI with a focus in Creative Writing, received an honorable discharge from the United States Air Force and is a current member of the American Legion. John’s debut novel, The God Killers was published in 2013 by Seventh Star Press. John currently resides in Indianapolis, Indiana with his wife and son. LATEST CODENAME: KNIGHT RANGER REVIEW! Here’s the latest review for Codename: Knight Ranger! “There are enemies that exist beyond general human awareness and comprehension; enemies thought to be products of lore and nightmares. The premise of Codename: Knight Ranger, an exciting science fiction thriller written by John F. Allen, is that monsters are real. Werewolves, vampires and a variety of creatures thought to be frightful products of human imaginings are indeed substantive…and lethal. A select group of humans are at war with these monsters. Ranger Captain Alexandre Du Bois becomes an unwilling participant in this invisible war when his unit in Afghanistan is ambushed. The captain suffers catastrophic injuries. In fact ‘catastrophic’ drastically understates his condition. Du Bois dies but is brought back to life by means that becomes key to his subsequent alteration. Thanks to an enigmatic organization led by a mysterious mastermind named Bishop, Du Bois is outfitted with a new body complete with enhanced capabilities, a kind of six million man on mega doses of steroids. To top it off, he’s provided with a super durable armored suit, packed with enough fire power to shred an army. But the transition from ordinary man to ultra-soldier becomes a jarring shock to Du Bois’ senses. Not to mention the costs that his commitment as an ultra soldier entails, a cost that deeply embitters him. Having never consented to this transformation, Du Bois bears enmity toward the person responsible for his condition: Bishop. Nevertheless, Du Bois is a soldier, and he will do his duty, because if he doesn’t, the monsters win.